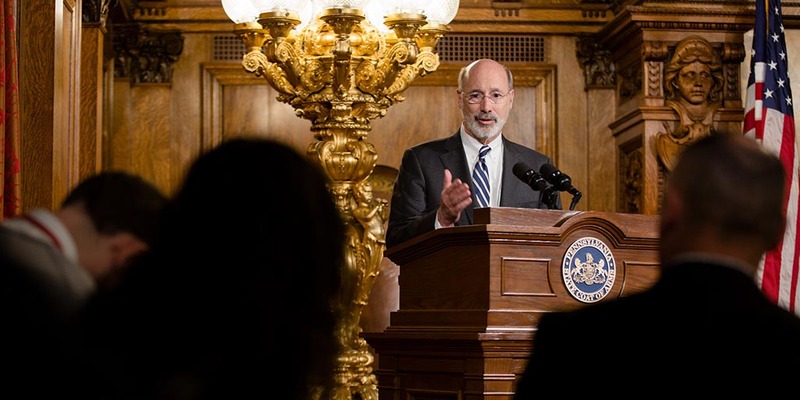 Pittsburgh, PA – Governor Tom Wolf today introduced his “Citizens First” ethics reform plan that includes a gift ban for public officials, ‘no budget, no pay’ legislation, public official expense reform, and steps to curb the influence of special interests in Harrisburg. Governor Wolf, who donates his salary to charity and refuses his state pension, has been leading by example in fighting to change Harrisburg: he enacted the strongest executive branch ethics reforms in the country. On his first day in office, he ended pay-to-play legal contracting and banned members of his administration from taking gifts from special interests. Over the last three years, Governor Wolf has also been the leading advocate in Harrisburg for broader reforms for ethics, voting and curbing the influence of special interests. Gift Ban for Public Officials: Governor Wolf banned members of his administration from accepting gifts, and believes all public officials should be held to the same standard. Pennsylvania is one of ten states with no specific law limiting gifts to public officials. Outside the executive branch, politicians in Harrisburg can take unlimited gifts from special interests. Governor Wolf wants his gift ban made permanent and expanded so all state elected officials are accountable to it. No Budget, No Pay: The influence of special interests in Harrisburg has crippled the Commonwealth’s budget process. This has resulted in a late budget in 6 of the last 10 years. Governor Wolf is calling for a “No Budget, No Pay” bill to stop paying legislators and their top staff, as well as the governor and top officials in the executive branch, until a complete budget is passed. Campaign Finance Reform: Enacting new campaign finance laws that would place limits on contributions to candidates seeking elected office, implement aggregate limits for races, place sensible restrictions on Political Action Committees (PACs), and strengthen reporting and disclosure requirements across the board to restore confidence in government, and curtail the role of campaign spending in our political process. Pay-to-Play Protections: Implementing broader “pay-to-play” provisions requiring the disclosure of campaign contributions made by parties seeking contracts. Outside Income Transparency: Requiring public officials to disclose sources, type of work, and amount of outside income received. Require Receipts for Public Official Expenses: In Governor Wolf’s administration and most of the private sector, employees pay for expenses, provide receipts and then are reimbursed. Currently, receipts are not required for all officials to be reimbursed with taxpayer dollars. Governor Wolf thinks the system should be reformed to cover all those serving in government, only allowing them to be reimbursed for the reasonable cost of travel, lodging, or food with an itemized receipt. Reforming government is one of Governor Wolf’s top priorities, and this new initiative will build on what he has already accomplished. The governor refuses a pension and donates his salary to charity, banned administration officials and state employees from accepting gifts, signed comprehensive pension reform, and started the Governor’s Office of Transformation, Innovation, Management, and Efficiency (GO-TIME), saving the commonwealth over $373 million in the last two years.